We are happy to announce that if you are booking a tour between the dates of December 1st 2018 to March 31st 2019 we will again be offering 3 different pickup points in Nagano City during winter 2018/19! This service is available for both our 1-Day Snow Monkeys, Zenko-ji Temple and Sake and 1-Day Snow Monkeys & Snow Fun in Shiga Kogen tours. It is provided at no additional cost so please read on if you are booking a tour between those dates! On the morning of your tour we offer 3 pickup points in Nagano City for the convenience of guests staying at accommodation spread throughout the city. 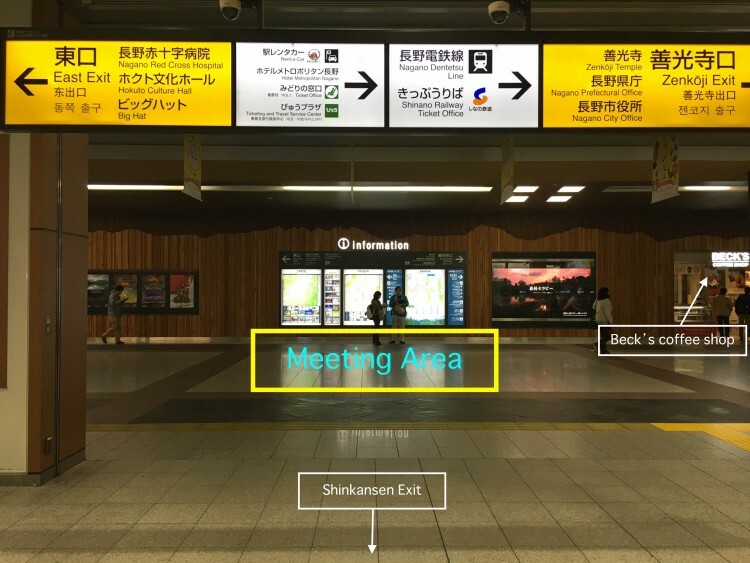 Our main pickup point remains as JR Nagano Station, in front of the Information Board directly across from the shinkansen gates, at 9:35 (as pictured below). If you want to meet your guide at the station there is no need to request a specific pickup point. 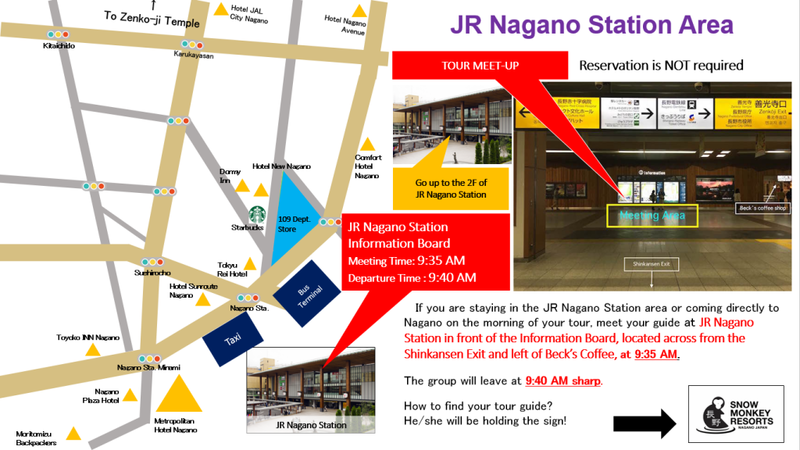 Just book your tour, note the meetup time at JR Nagano Station, and we’ll see you there! However, prior to arriving at the station we will also be collecting guests from two other designated locations. If you are intending to stay at accommodation in the area of Zenko-ji Temple or Hotel Kokusai 21, these pickup points may well be more convenient for you! 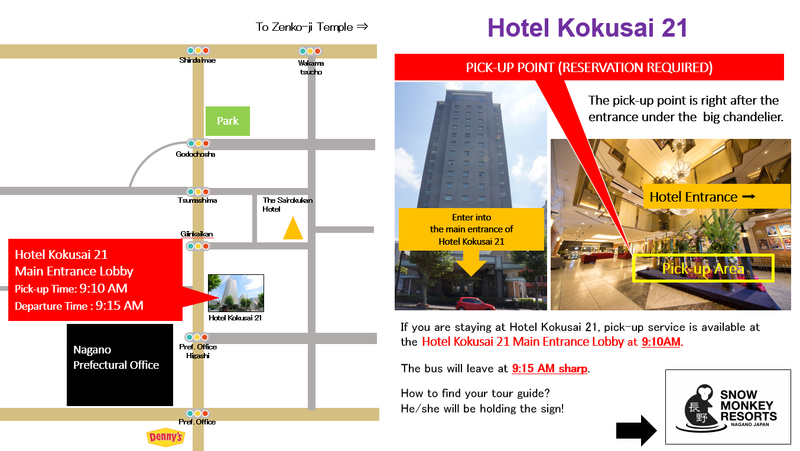 Please note, that requests for pickup at either at Pickup Point ① or Pickup Point ② must be made at least 3 business days in advance of your tour. Guests coming to Nagano by train on the morning of the tour, or those staying at a hotel nearby the station, simply meet your guide in front of the Information Board across from the Shinkansen Exit at Nagano Station at 9:35AM. How do I request pickup at 1. Zenko-ji Temple Area or 2. Hotel Kokusai 21 Area? 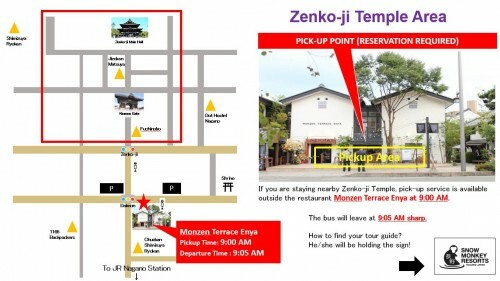 If you are staying nearby either Pickup Point 1: Zenko-ji Temple Area or Pickup Point 2: Hotel Kokusai 21 Area, you can make a reservation to be collected by your guide at either of those locations by simply selecting your desired pickup point from the dropdown box at the time of booking. I’ve already booked and paid for my tour and now I want to request pickup at 1. Zenko-ji Temple Area or 2. Hotel Kokusai 21 Area? No problem at all! Simply reply to the last email we sent you requesting your preferred pickup point. Please ensure that we receive your pickup request at least 3 business days prior to your scheduled tour. We look forward to welcoming you to Nagano!